“I gathered all my eggs in one basket, because I believe in collectivism, and I wanted a tyrannical omelet. When I was in Japan I used to get my lunch from these little places that were takeaway only. I guess it was like a Japanese Deli. All the names of stuff were in Japanese Kanji (chinese characters) and I usually just guessed at what they were. I liked to try different things. Sometimes it was good, sometimes it was not. One time I came back with a rice bowl with chicken and yellow stuff. It was pretty tasty. I looked long and hard at the Kanji on the label and deduced one of the words was “child”. Odd. So I asked my co-worker what the other symbol was: “parent”. Parent and child was the name of the dish. It was chicken and egg on rice. When I say it like that it sounds good, but as soon as I looked at the symbols and could see the words parent and child, my stomach rolled. Just this morning I got back from a big run and was mega hungry for eggs. I had some leftover roast chicken in the fridge so I put together this quiche/omlette like contraption. 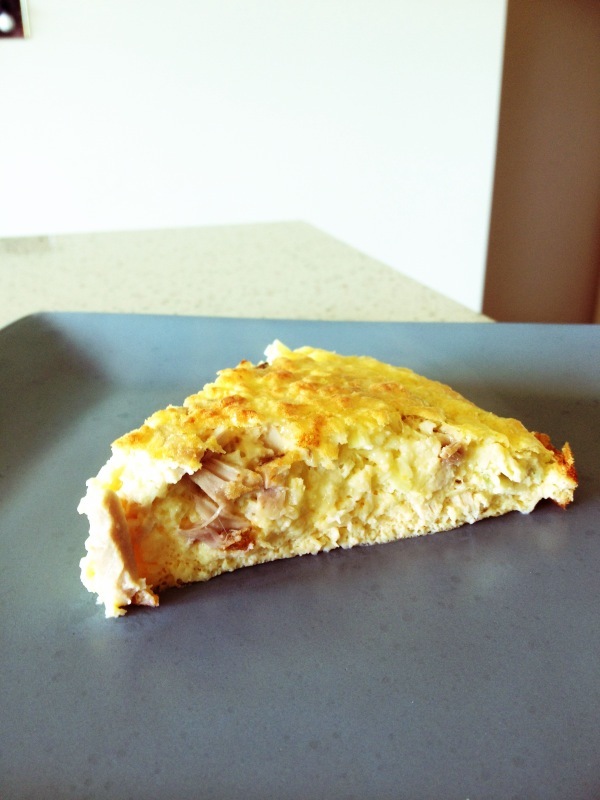 It was great, and I guess it could be called Oyako Quiche……. It’s quick, nutritious and just what you might need after a big early morning exercise session. It would be great to cut into quarters and keep in the fridge to heat up in the mornings as a super quick brekky. Roughly chop the cheese and leeks and whiz in the blender with the eggs. Bake in a moderate oven for about 20 minutes or until set. This is one of those meals that came about from trying to only cook with what you had in your fridge (due to a bad case of can’t be arsed leaving the house). Turned out quite well, really. Both kids thought it was great, hubby went back for seconds and I got that sense of satisfaction when you use up random leftovers. I use rice milk in this only because I usually make a separate little Quiche for Luci, who can’t eat dairy. You could just put in regular milk. The green tomato chutney was a housewarming gift. It had whole tiny tomatoes. Quite chunky and tangy. You could easily put in anything that is a little bit salty and vinegary instead of this. Lastly, I bake this in a spring-form tin because I can never get anything out of my silicon flan dish. It is a great dish in theory, but you need two sets of hands to get something out of it and that still often ends badly. NOTE: Every time I make Quiche I forget two things: 1. Trying to cut up a hot Quiche will always end in messy crumble. 2. It is incredibly hard to eat freshly baked Quiche without burning your mouth. Put the eggs, milk, salt and onion in your blender. Whizz until it all mixed/chopped. Cover the base of a spring-form tin with the frozen veggies. Pour half the egg mixture over it. Add a layer of chutney and then the cheese. Finish with the potato and then pour over the remaining egg mixture. Bake in a moderate oven for about 40-50 min, just keep checking to see when it is firm.